The new Cat® MH3022 and MH3024 are the smallest models in the new Caterpillar line of wheeled material handlers in the greater-than-20-tonne size class. Building on the solid reputation of their predecessor models, the MH3022 and MH3024 feature a new engine and redesigned hydraulic system that combine to reduce fuel consumption by up to 10%. Redesign of the cab and cab access, added lighting, and vision-enhancing cameras promote greater safety, comfort, and convenience for the operator, and a wide choice of dedicated front linkages, work tools, guards, and undercarriages allow the new purpose-built models to work productively and durably in industrial, scrap-recycling, mill-yard, and waterway applications. 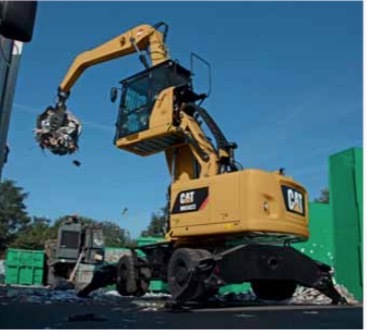 Intensive field surveys help Caterpillar continuously improve the design of wheeled material handlers for low-cost operation and maximum value, while maintaining proven quality, reliability, and features, such as the Cat SmartboomTM, load-sensing hydraulics, dedicated swing pump, and large working envelope. The MH3022 and MH3024 use the Cat C7.1 ACERTTM engine, rated at 169 horsepower (126kW, 171 PS), and have operating weights of 22.7 and 25.7 metric tonnes, respectively. The engine meets US EPA Tier 4 Final/EU Stage IV emission standards and features refinements that yield added torque and faster response to changes in load. With a durable, field proven design, the engine now integrates an emissions after-treatment system, which requires no attention other than periodically replenishing the diesel exhaust fluid (DEF) tank. Emissions technology includes the Cat NOx-reduction system, selective catalytic reduction, diesel oxidation catalyst, diesel particulate filter (DPF), and high-pressure/common-rail fuel system. An engine-idle shutdown system saves fuel by shutting down the engine when it has been idling for a preset amount of time. In addition, the Eco Mode has been refined and reduces engine speed with no reduction of power, providing reduced fuel consumption with no compromise in performance. The exterior has been completely restyled, including a new operator station, with higher pressurization, larger door with added glass, new windshield with parallel wipers, new mirrors (with a heated option), new rain visor and light protectors, larger skylight, standard rearview camera, and a right-side camera with a separate in-cab monitor. Cabin guards are available for additional operator protection when required. Entering and exiting the cabin is now easier with redesigned three access steps and a newly designed door handrail. A fourth step is integrated directly into the skirt of the upper carriage. Inside the cabin, the left-hand console tilts to facilitate entering and leaving the seat, and the console includes an integral safety lever. Also new is the steering wheel, which is height adjustable and features a tilting column. The cabin has an interior sound level of just 71 dB(A), and vibration levels have been reduced. match application needs, increase stability, and provide great lift capacities. The MH3022 and MH3024 also incorporate a PIN- code anti-theft system. An automatic system senses machine parameters and locks the axle-oscillation function and sets the service brakes, readying the machine to work. This reduces operator fatigue by removing the need to constantly press the brake pedal and results in added productivity. Brake and axle lock are automatically released when the operator presses the travel pedal again. The engine is longitudinally mounted with the cooling package forward of the engine, resulting in easy, ground-level access to routine maintenance points. An electric fuel-priming pump eliminates filling filters before installation. All the coolers are now grouped in the same compartment, and the condenser can be tilted with no tool for ease of cleaning. Electrical and hydraulic components are now grouped in specific areas for ease of service, and an automatic centralized greasing device (Auto-lube) is standard. Access to the top platform is improved, including a new service platform for DEF and fuelling, and new handrails. To assist customers in improving jobsite efficiency and managing the MH3022 and MH3024 for optimum return on investment, Cat Connect offers LINK and DETECT technologies. Product LinkTM helps fleet owners track locations, hours, fuel consumption, idle time, events and diagnostic codes by wirelessly reporting all via the online VisionLink® user interface to help lower owning and operating costs. The MH3022 and MH3024 can be equipped with a variable angle boom, one-piece boom, or material handling boom, as well as a choice of sticks, quick coupler, and work tools. As matching work tools with the machine is critical for productivity and efficiency, a variety of Cat work tools are offered to dig, sort, load or strip any kind of material. Machine hydraulic pressures and flows can be easily adjusted from the in-cab monitor, while the operator can adjust the machine behaviour to the task and to personal preference.